Age: Suitable from 3 months to 55 lbs. 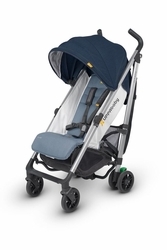 The G-LUXE lightweight umbrella stroller provides flexibility every parent needs. Whether an ideal companion for running errands or the perfect ride for catching the sites while your little one reclines for a quiet nap, the G-LUXE has your travel needs covered. At just under 15lbs you can easily pick up and carry over your shoulder or fold to a standing position and tuck into the corner. UPDATED Lightweight aluminum frame with robust profile and 2 single front wheels as opposed to traditional 2 double front wheels.